As we continue to scan the charts for setups and trigger to alert our followers, we’ve come across a setup that may be more ominous than what it appears. Recently we’ve posted articles about how the SPY and the NQ have pushed into new all-time high price territory and how Gold is setting up for a momentum base that should launch precious metals to near highs. We’ve also discussed how we believe the current upside price bias in the US stock markets should last another 10~35+ days before new price weakness sets up – possibly pushing prices lower in late May or early June 2019. Our research team has been scanning the charts looking for anything that could give us an edge to the potential setup for this price weakness in the future. We believe the Transportation Index and the Financials could be keys to understanding how far the upside rally can continue and when a price peak may begin to warn of a potential price top or rollover. An Island Top is a pattern that sets up with an upside price gap followed by sideways price action above that gap. In theory, this type of setup should promote the gap to be filled with downside price action before any further upside price move can continue. Although, gaps to the upside are fairly common in strong uptrends. Given the strength of the earnings data released early this week and the expectations that we have for some continued upside price bias over the next 10~35+ days, we are watching these Island Top formation in the Financials for any signs of weakness to alert our followers. This Daily FAS chart highlights the GAP as well as the Resistance levels that are currently acting as a ceiling. 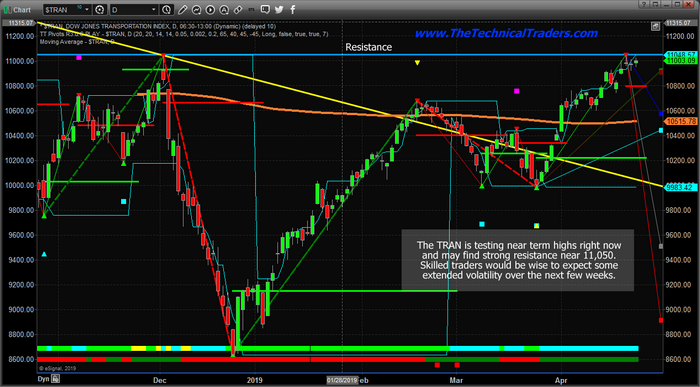 A breakout above the resistance level would indicate that we have more room to run higher. Any failed breakout to the upside, where price briefly rallies above the resistance level, then falls back below it, would be a pretty strong indication of a rotational peak. The Financials could fall 10% from current levels and still be within the range of the March/April lows. It would take a much bigger move to qualify as a breakdown bearish trend. This Daily XLF chart highlights a similar pattern to the FAS chart. 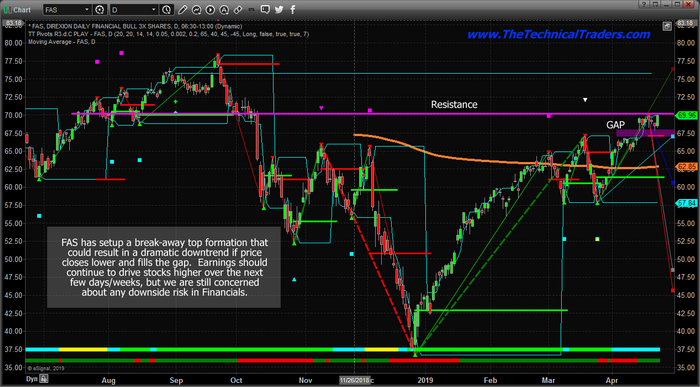 The key element of the XLF chart is that the Resistance level provides more key fundamental price peaks than the FAS chart. On this XLF chart, we can see that the current Resistance level aligns perfectly with the Nov/Dec 2018 highs. We can also see a short GREEN Fibonacci trigger level line in early March 2019 above the Resistance level. That Fibonacci trigger level is still valid and any move above that level would constitute a new bullish price trend trigger. Any failure to break the Resistance level would qualify as a price rotation to fill the GAP and potentially set up a move back to near $25 looking to find new support. Overall, the Financials are poised for a move – up or down. Our research suggests the US stock market is not done rising, thus we are concerned that certain sectors may begin to show signs of weakness as the broader market continues to rise. Our research team believes a critical peak formation is likely near the end of May or in early June 2019. It is because of this belief that we are warning traders to play the next 15~25+ days very cautiously. Watch the Financials, the Transportation Index, the US Dollar, and Precious Metals. We believe any early signs of weakness will be found within these symbols. The financial institution initiated on Aquestive with a Buy rating and a $10 per share price target. In comparison, the biopharma’s stock is trading at around $6.29 per share. The current market valuation is unwarranted, Selvaraju indicated, and, therefore, presents an opportune time to buy. The analyst described Aquestive, its existing products and advanced pipeline candidates. Through its PharmFilm platform, Aquestive is developing existing drugs in an oral, dissolving film formulation, providing an alternative to tablets and capsules, particularly for patients with trouble swallowing. The films are either buccal, placed inside the cheek; sublingual, placed under the tongue; or lingual, placed on the tongue. Aquestive already has made and commercialized film versions for Suboxone (a combination of buprenorphine and naloxone) for treating opioid addiction, Zuplenz (ondansetron) as a therapy for nausea and vomiting and Sympazan (clobazam) for treating Lennox-Gastaut syndrome (LGS), a pediatric epilepsy disorder. Also, the biopharma has several products in late-stage development. The two Selvaraju expects to reach the market in 2020 are Libervant (diazepam), a buccal film for treating refractory seizures, and Exservan (riluzole), an oral film therapeutic for amyotrophic lateral sclerosis. A third, being developed with partner Sunovion, is APL-130277 (apomorphine), a sublingual film for treating Parkinson’s disease. Were APL-130277 approved, it could “yield low single-digit royalties on net sales to Aquestive, along with up to $45 million in milestone payments,” highlighted Selvaraju. He went on to point out the Aquestive story’s other positive aspects. One is that the target markets for the company’s products are “attractive due to their large size.” For instance, in the United States, about 1.1 million patients have refractory epilepsypotential users of Libervantand about 500,000 patients have Parkinson’s disease and experience off episodespossible takers of APL-130277. In addition, Selvaraju noted, the targeted prescribers are primarily made up of specialists, like neurologists, “who represent small populations typically prescribing substantial volumes of these kinds of drugs.” As such, he added, Aquestive should be able to commercialize its products like Sympazan and Libervant with a small salesforce and, “establish easily defensible niches, particularly among patients with dysphagia.” Uptake should be rapid, given the products’ well-known and proven mechanisms of action. Another advantage for Aquestive is that all of its films are eligible for approval via the accelerated 505(b)(2) pathway. Further, the company’s business model is dual layered, meaning it “melds royalty streams from partners with sales of proprietary niche products that the company intends to self-commercialize,” Selvaraju commented. Lastly, Selvaraju highlighted that potential upside exists, largely because H.C. Wainwright’s $10 target price only takes into account future revenues from Sympazan, Libervant, Suboxone, Zuplenz and APL-13027, not any of the pipeline agents. Ltd. (including, without limitation, any option, right, warrant, future, long or short position). A research analyst of the firm and/or the research analysts household has a financial interest in and own the securities of Adamas Pharmaceuticals, Inc. (including, without limitation, any option, right, warrant, future, long or short position). Pharmaceuticals, Inc., Ironwood Pharmaceuticals, Inc. and Intec Pharma Ltd. for investment banking services within twelve months before, but will seek compensation from the companies mentioned in this report for investment banking services within three months following publication of the research report. within three months following publication of the research report. The Firm does not make a market in IntelGenx Technologies Corp. as of the date of this research report. The Firm does not make a market in Aquestive Therapeutics, Inc., Acorda Therapeutics, Inc., Adamas Pharmaceuticals, Inc., IntelGenx Technologies Corp., Ironwood Pharmaceuticals, Inc. and Intec Pharma Ltd. as of the date of this research report. The DOW Transportation Index continues to test resistance near $10,050 as earnings drive the NQ well past historical all-time highs. Our interest in the Transportation Index is because it acts as a fundamental indicator for the US and global economies in terms of future transportation/shipping expectations. When the Transportation Index rises, it is a good sign that business and consumers have faith in the future economy and the continued demand for goods to be supplied to retailers and distribution centers. The fact that the TRAN is back to near December 2018 highs means we have reached an expected economic expansion level that equals that level just before Christmas 2018. A continued rally would push expectations even higher going into the Summer months. With earnings hitting the market hard today driving a strong rally in almost all the major US stock indexes, we are surprised that the TRAN did not move a bit higher on the news. Should the resistance level near $11,050 continue to operate as a ceiling for the TRAN, we’ll know soon enough as price should begin to move back below $11,000 and possibly attempt to retest $10,800. A key Fibonacci trigger level currently rests near $10,800 that would indicate a potential for a new bearish trend if this level is broken. 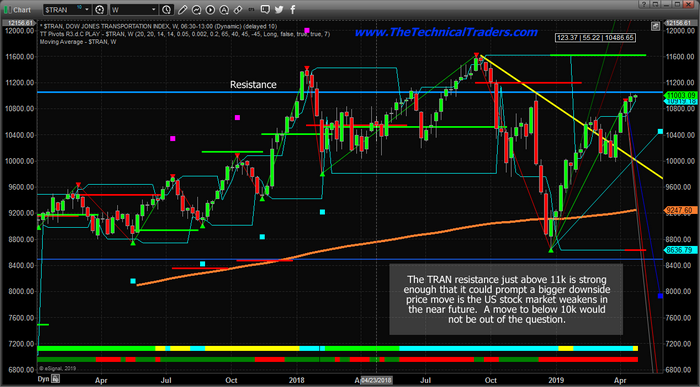 This Weekly TRAN chart, below, highlights just how important the current resistance level really is. This $11,050 level actually plays a key role in the 2018 price rotation and is the key resistance level for the December 2018 rotation peak. As we’ve continually suggested, Fibonacci price theory suggests that price must always attempt to establish new price highs or new price lows. If this new price high, above the $11,050 fails, then price should attempt to rotate lower and attempt to break the $10,000 low level created in early April 2019. We suggest traders take a very cautious long-biased stance in the markets right now. Weakness could come out of the shadows fairly quickly as earnings hit. The Iran Oil news hit the markets quickly on Monday. We could wake up to some dire earnings news this week that could send the markets lower and push some of these resistance levels into a topping formation. Additionally, as you look at this Weekly chart, pay attention to the fact that we could be setting up a Right Shoulder of a Head-n-Shoulders pattern if new all-time highs are not reached. 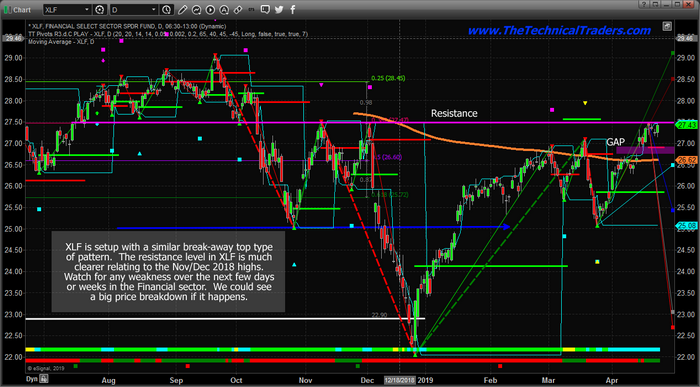 There are many ways to attempt to read this chart and the TRAN should lead the markets if a price move does breakout. Our research says we should continue to see an upward price bias for at least another 10~35+ days before any real sign of weakness shows up. We are still urging traders to take a very cautious approach to their trading until we see the TRAN break to new highs. We feel it is wise to trade this area very cautiously over the next 30+ days. 2018 was a terrible year for commodities, but few sectors fared as badly as lithium. The crucial battery metal, also known as “White petroleum“, struggled through a 50 percent price correction as supply soared and demand fears spread like wildfire. But it isn’t time to give up on lithium stocks just yet. The rising stars of the hard-rock lithium space are transforming the industry with their remarkable ability to extract lithium at a lower cost and faster pace than the lithium majors can from their brine deposits. In short, there’s a new caliber of producer in town and – with lithium demand set to soar once again – their timing could not be better. The three stand out companies in the hard-rock mining space at the moment are Albemarle (NYSE:ALB), Chinese Tianqi Lithium (SZSE:002466) and Power Metals (TSXV: PWM; OTC:PWRMF). And each of these companies are able to bring lithium to market faster and cleaner than their brine-based competitors. Before examining the hard rock lithium space though, we need to take a closer look at the market itself. Overall, the supply-demand balance is actually much tighter than prices suggest. After all, the soaring demand from tech and energy sectors that triggered lithium’s meteoric rise in 2018 didn’t vanish overnight. The lithium boom began in earnest in 2014, with prices rising from less than $6k a ton to more than $16k by 2018. With demand soaring, billions were invested in new mines, with salt brine deposits in Chile and China getting most of the attention. But after a few banner years, Wall Street started looking at Lithium with more suspicion. In February 2018 Morgan Stanley issued a crushing report: the firm determined that Chilean brine would add 200kt to the market by 2025, effectively doubling supply. That sent lithium prices plummeting. In China, lithium carbonate prices fell by 50.31%, crushed by reports of the over-supply. But by year’s end, some of those fears had begun to dissipate. Huge projects that were expected to flood the market began experiencing delays. You see, salt brine lithium production, which accounts for most of the market, takes a while to get going: salt water is pumped to the surface where it evaporates to form potassium deposits containing lithium. Take Orocobre in Brisbane, Australia, and its Salar de Olaroz facility in Argentina, which was meant to supply 42.5k tons. Delays, legal troubles and mounting expenses has brought the project basically to a halt. These major firms saw their prices tank last year, as the lithium bubble burst in the wake of the Morgan Stanley report and fears of future over-supply. But that doesn’t mean the lithium party is over. In fact, it may have only just started. Hard-rock lithium miners in hotspots such as Australia, Canada and China are warming up for the next bull run in this crucial commodity. The legendary Greenbushes mine which is operated by Tianqi (SZSE:002466) and Albemarle (NYSE:ALB) has been in operation for 30 years, and produces a safe and ‘dry’ source of lithium gained from ‘spodumene’, a mineral that contains high-grade lithium. The lithium holding spodumene here is found in pegmatite zones of which the metallurgy is currently being tested by SGS Canada. Hard rock miners do not only have cleaner production methods, they also have one leg up on the competition as they are likely to bring new supply to the marketplace quicker than their brine-mining peers do. 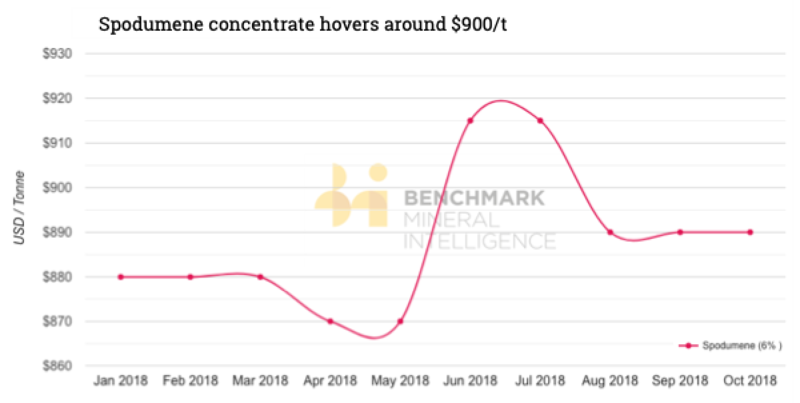 According to Benchmark Minerals intelligence, there’s a huge discrepancy between lithium prices and the lithium demand side. In September 2018, analysts at CRU estimated a lithium surplus for the year of only 22k tons, against demand of 277k tons. Let’s take a look at key demand drivers for lithium. First, there’s electric vehicles (EV). According to Argus Media, lithium ion batteries in EVs have increased from 10 GWh to 70 GWh in only a decade, with estimates placing the market to reach 223 GWh by 2025, an increase of 300x from current levels. 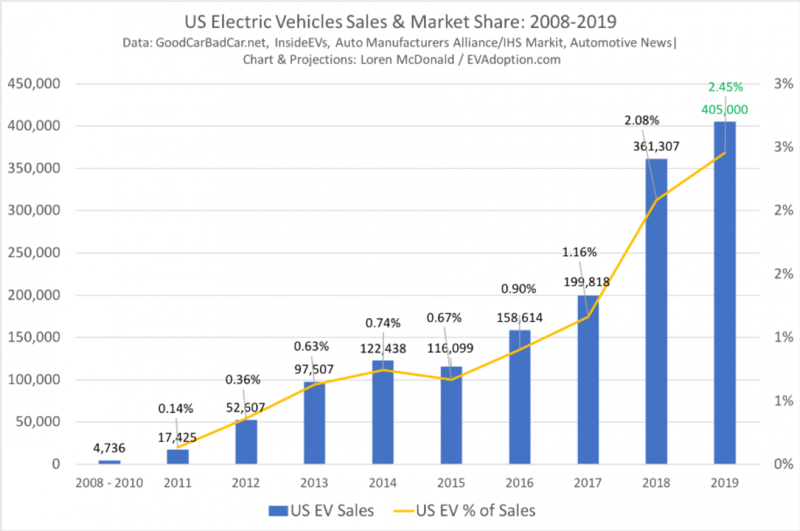 EVs have been taking off in the United States, with sales increasing by 81% in 2018, though a more modest increase is expected in 2019. EVs take up 2.4% of total vehicles in the United States. Where demand is really soaring is in China. More than 2 million EVs will be sold this year, up from 1.1 million last year. It’s part of the government’s plan to have 50% market share for EVs by 2025. Consumers in Europe are also turning towards EVs, which now make up considerable portions of total vehicle fleets in Norway, Holland and France. EV sales jumped 67% in Europe, led by affordable EV models from Renault and Nissan. Fastmarket predicts EV market penetration of 15% by 2025, up from only 2% currently. But with such ambitious plans in place in China, one of the world’s most important car markets, that figure could be on the conservative side. According to Simon Moores of Benchmark Minerals, EVs and an increase in battery storage demand “has sparked a wave of lithium ion battery mega factories,” such as Tesla’s famous Gigafactory. Currently, 70 lithium-ion battery “mega” factories are under construction, up from only 17 in October 2017. Elon Musk wants 20 gigafactories producing lithium batteries for Tesla EVs by the next decade. Benchmark thinks new factories will be using up 534,000 tons in new demand (on top of current demand of 200,000 tons) by 2028. That’s the other demand side factor: as the energy storage sector grows, demand for lithium-ion batteries will grow by leaps and bounds. By one estimate, the market could reach $92 billion by 2024, with a CAGR of 16%. The market was worth $21.6 billion in 2018. A slightly more conservative estimate has the market reaching $40 billion by 2025, but that’s still nearly 100% in growth in less than a decade. Another estimate is $60 billion by 2024. Due to declining prices, Bloomberg raised its forecast for lithium ion batteries due to lower than expected prices. 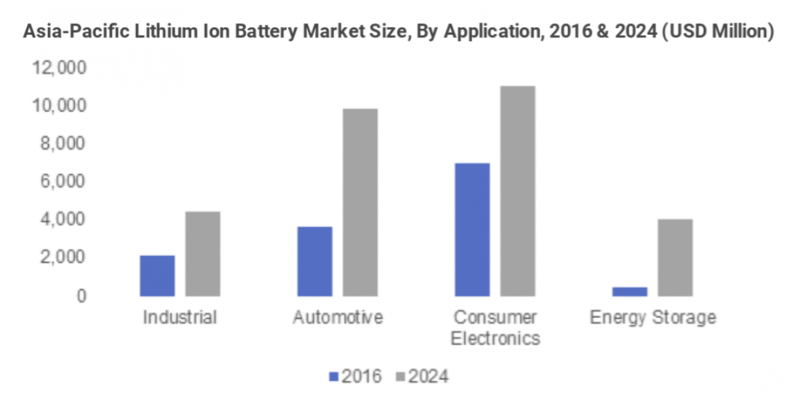 The best estimate is from Global Market Insights, which predicts energy storage and automotive lithium ion battery demand to double by 2024. The expectation from GMI is that the bulk of new battery production will come from China, where batteries have a large internal market. So how will this play out in the lithium sector? One major take-away here is that traditional lithium production—through salt-brine evaporation—may lose market share to newer and more competitive production methods, particularly spodumene or “hard-rock” lithium mining, where the lithium is extracted by drilling directly into rich deposits. Australia. Lithium giant Albemarle has gone so far as to halt all expansions of salt brine in South America, the so-called “lithium triangle,” and has instead been pouring resources into the Greenbushes project, where capacity is doubling. Demand for spodumene is reflecting rising prices, which spiked in 2018 even as lithium prices across the board were slumping. In 2018 there were four new spodumene operations. But in China, General Lithium Corp. is planning a new mineral ore converter project that will triple production capacity for lithium by the end of 2020. The plant will take in spodumene and convert it into lithium—60,000 tons per year, according to company estimates. That’s from 135,000 tons of spodumene. 1.75% Li20 with intervals as high as 3.5%, it competes directly with projects like Greenbushes in Australia, the world’s largest operating hard-rock lithium mine. VP of exploration Julie Selway, could be the next gamechanging hard-rock lithium plays in Canada. Power Metals is just one example of this new trend in the lithium space. The entire sector is being transformed from within, and with prices stabilizing there are plenty of opportunities for investors in 2019. A lithium renaissance is well and truly underway, and it is hard-rock miners who find themselves at the forefront of this movement. Admiral Markets has partnered with Trading Central to provide clients with a suite of new market analysis and trading features. Admiral Markets’ new offering of Trading Central’s Technical Insight and Forex Featured Ideas form a powerful, advanced addition to both MetaTrader 4 and MetaTrader5 platforms. Collectively, these two new award-winning tools empower today’s trader with a wide range of rich technical analytics, trading indicators and industry-leading pattern recognition. Featured Ideas™ delivers traders unbiased, intraday trading ideas tailored to each individual trader’s preferences such as holding timeframes, favourite patterns or preferred currencies. These new features are currently available to all Admiral Markets clients using the desktop version of MetaTrader 4 or MetaTrader 5, via the exclusive MetaTrader Supreme Edition plugin. Featured Ideas’ transparent and educational feature set helps teach new traders about technical analysis and assists traders of skill-levels in forming confident, timely decisions. Each idea offers clear and concise commentary on why this idea was displayed, and what the technical events mean for price movement. Hovering over the pattern will teach you about that technical patterns and “watching” an idea will allow you to keep track of how it performs so you can make a confident, educated decision next time you see that pattern. Technical Insight™ combines actionable, technical analysis from virtually every financial instrument to help traders optimise their trading strategies. Through a balanced feature set of detailed, proactive analytics, educational guidance and customisable options, Technical Insight™ empowers traders of all skill levels to take control of their investments. Traders can continue to learn about any instrument through the “Learn more” and “View Historical Events” buttons. This progressive disclosure of information allows new traders a jumping off point to begin trading and the ability to continue learning at their own pace. The Technical Summary Score removes the need to wade through extraneous details to form a decision. It enables traders to see a concise technical outlook across three timeframes in an instant! 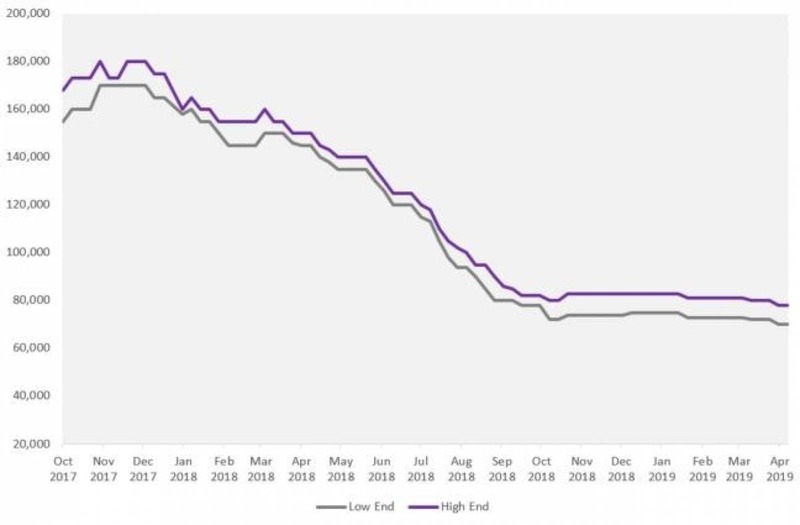 Using a proprietary weight-of-evidence approach, the Score displays the directional outlook of either bullish, bearish or neutral, across short- to long-term timeframes, to provide simplistic support at the moment it’s needed. “At Trading Central, we’re dedicated to empowering traders with actionable research and insightful analytics that support them at the point of action. Technical Insight does just that, by making detailed, award-winning technical analysis, concise insight and education approachable for today’s investors,” says Alain Pellier, CEO of Trading Central. Admiral Markets is a leading online Forex and CFD trading provider. In addition to a wide range of financial instruments, Admiral Markets offers free educational materials, including analytics, webinars and seminars. Admiral Markets is proud to announce being awarded the coveted “2019 CFD Broker of the Year” award by a customer survey conducted by Broker-Test.de, on the eve of celebrating 18 years of success in trading and client service. Trading Central has been successfully supporting investment decisions through innovation since 1999. Our broad portfolio of market solutions combines award-winning analyst research and patented pattern recognition with 24H global multi-asset coverage. Collectively, these provide technical and fundamental analysis on 75,000+ instruments every market day to offer timely and actionable insight. Our tools empower today’s investors to participate in financial markets by helping them to generate trade ideas, validate investment decisions and manage risk- all at the point of action. Michael Rowley, CEO of Group Ten Metals, sits down with Maurice Jackson of Proven and Probable to provide an update on the company’s exploration efforts. Maurice Jackson: Joining us today is Michael Rowley, president and CEO of Group Ten Metals Inc. (PGE:TSX.V; PGEZF:OTC), which is known for platinum, palladium, nickel, copper and cobalt in the Stillwater district in Montana. 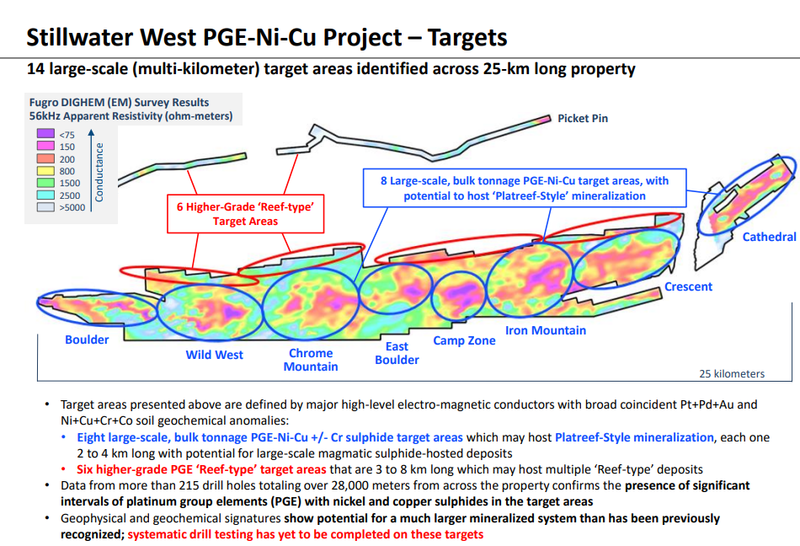 In our last interview we discussed the results you released in the second of a series of news releases with high-grade and bulk tonnage targets in the Chrome Mountain and East Boulder areas of the 25-kilometer Stillwater West project. Since then, Group Ten Metals has released news from the flagship Stillwater project, and also announced results and updates from its Yukon and Ontario projects. Mr. Rowley, for someone new to the story, who is Group Ten Metals and what are your targets and focus? Michael Rowley: Group Ten has been acquiring and consolidating quality projects in known mining jurisdictions since 2012, so we were able to acquire and build world-class assets in three top-tier mining districtsin Montana, in Ontario, and in the Yukonon terms that reflect the market’s discount at the time. 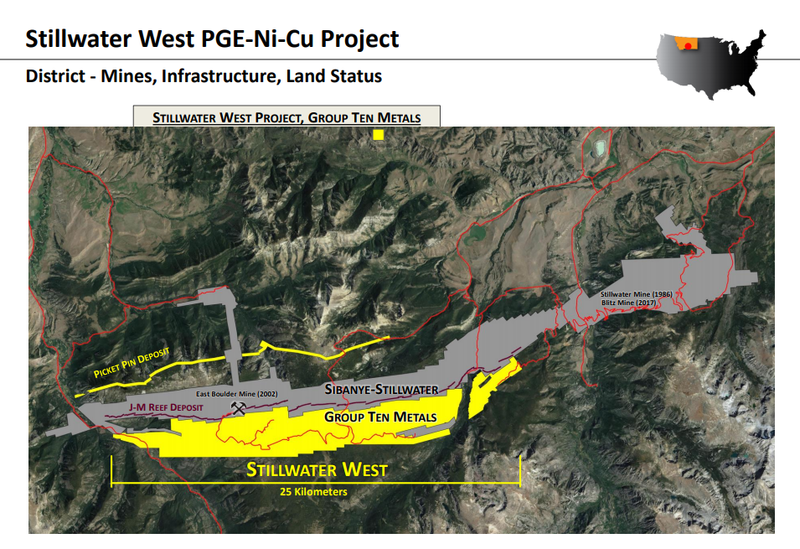 Since the acquisition of our flagship Stillwater West project in 2017 we have been increasingly focused on monetizing our other assets in order to focus on Stillwater, which we see as having the potential to rapidly advance as a world-class PGE-Ni-Cu-Co project. As a result we are positioned with 100% ownership on large and highly prospective land positions in known mining districts at a time when the markets are turning positive and the appetite for acquisitions is returning. So that really is the pointwe are receiving increased interest on our non-core assets in the Yukon and Ontario at a time when deals for these assets will help drive our efforts in Montana at Stillwater. For the benefit of our readers I’ll give a short summary of the Yukon and Ontario projects before we focus on our flagship Stillwater project and the most recent news there. In the Yukon we have the Kluane PGE-Ni-Cu project, which is geologically similar to the Stillwater project, being a layered magmatic system. 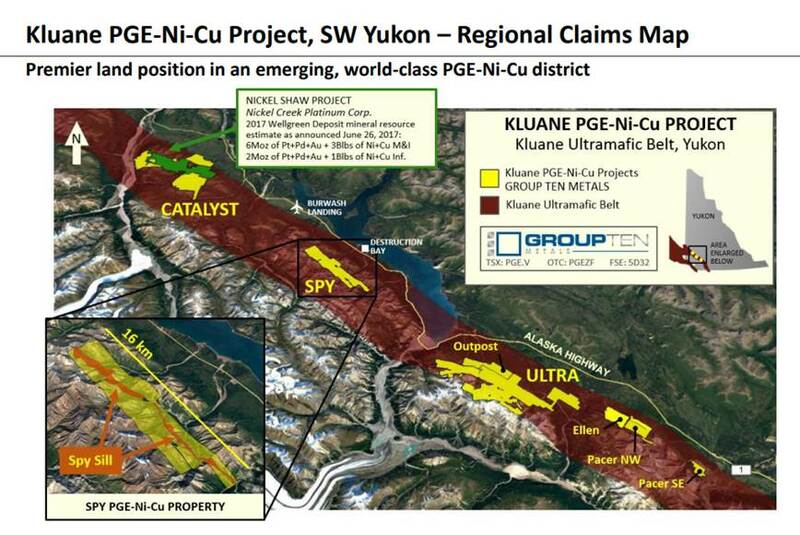 The Kluane belt is well known for PGE-Ni-Cu deposits and the most advanced is the Wellgreen Deposit now being advanced by Nickel Creek Platinum. That one is 6 billion ounces of PGE+Au and 4 billion pounds of Ni-Cu, with significant Co as well. We have the strike extension of that deposit on our ground, plus known showings and a similar geological setting across our 255 square kilometer land position in the Kluane belt. The project is at an earlier stage than Stillwater, but is highly prospective and is attracting interest from the industry. 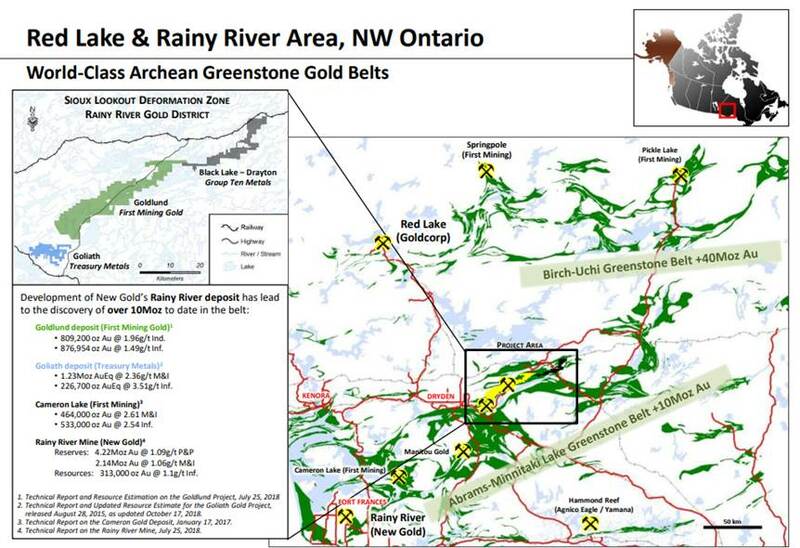 In Ontario we have the Black Lake-Drayton gold project, which adjoins and shares geology with First Mining’s Goldlund project and Treasury Metals’ Goliath project. Both are high-grade gold resources that share geology with our project, however our ground has seen much less exploration since 2000 for various reasons. Our most recent news reports a small till sampling program that, for the time, demonstrated the gold potential of the large middle area of the project where pervasive ground cover has limited past exploration interest. This is compelling because over 10 million ounces of gold has been discovered using this till sampling method in the area, and the hits we are getting correspond to geophysical anomalies. We also announced completion of the final earn-in at Black LakeDrayton and that, together with the success of the recent till sampling program, has brought increased interest from industry, which we are now following up on. Maurice Jackson: Thank you for the overview of your other assets. Mr. Rowley, on to the main event, the Stillwater West project in Montana. Please provide a summary of that project, and the thesis you are attempting to prove. Michael Rowley: We have a fantastic asset in the Stillwater West project, and we are excited about the targets and potential we see there. As you know, Group Ten is alongside the Stillwater Mines in the iconic Stillwater Igneous Complex. The district is well known as the highest grade major PGE district in the world, and the largest by far in the Western hemisphere. Sibanye bought the Stillwater mines for $2.2 billion in 2017, around the time we were making our acquisition there. Our ground was historically owned by Stillwater, and has been mined for a number of commodities including high-grade nickel and copper, as well as PGEs and chrome. We are the first to systematically consolidate the land package, database and team to target Platreef-style platinum-palladium-nickel-copper deposits. These are 100+ Moz PGE deposits with significant values of other metals, in particular nickel and copper, but also rhodium, cobalt and chrome, found in the northern limb of the Bushveld Complex in South Africa. The Bushveld and Stillwater complexes are both large igneous complexes, and there are many known parallels between the two. Developments in the 1990s and 2000s led to the discovery and development of the Platreef mines in South Africa, but that progression was essentially interrupted at Stillwater. Based on everything we’ve seen, we see the potential to discover massive PGE-Ni-Cu deposits of this type at Stillwater. That thesis took a big step forward late last year when Ivanhoe’s Dr. David Broughton, a key member of the discovery team at Ivanhoe’s 112 Moz Flatreef PGE-Ni-Cu project, joined our team and confirmed that potential. We acquired the project in 2017 and have now begun a series of news releases to reveal what we have found to date, and lay out our plans for 2019. Maurice Jackson: Mr. Rowley, in our previous interviews you alluded to a possibility of mine closures in South Africa as a potential catalyst for Group Ten Metals. We may have some interesting developments coming from SA. What can you share with us? As reminder for our audience 78% of Pt comes from South Africa, they are not earning their cost of capital, and there are number of geopolitical concerns there as well. 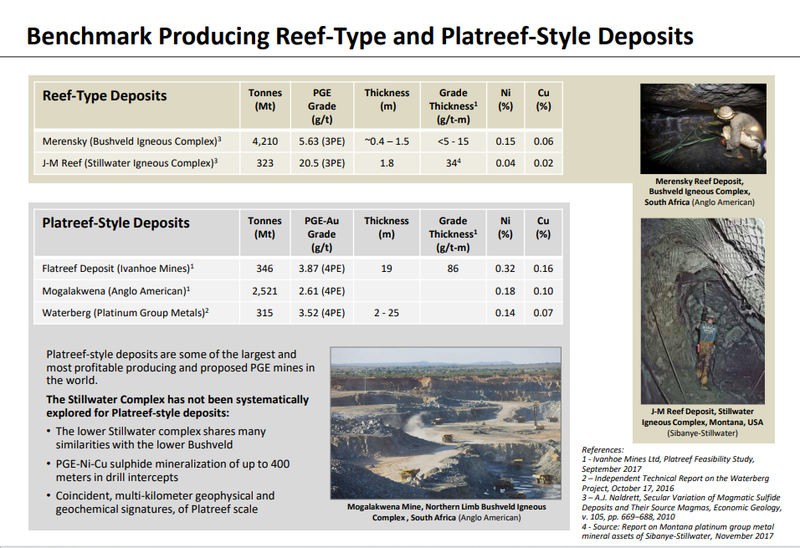 Michael Rowley: There are basically two types of platinum mines in South Africa: narrow, high-grade reef-type mines and the bulk tonnage mines on the Platreef in the north. Many of the high-grade producers have been sub-economic for years and have been underfunded as a result. This is partly because narrow, high-grade mining is always more expensive per tonne that bulk mining, and also because these mines are getting deep and hot and unsafe as well. As a result, analysts are predicting the closure of a number of South African high-grade platinum producers in the coming year or two, and that is expected to be a significant driver of platinum price as a result of decreased supply. By contrast, the Platreef district is known for its thick mineralized intervals that are very amenable to bulk mining. Anglo American operates the Mogalakwena mine in the Platreef district and it is currently producing platinum at less than $400/oz from four pits, along with palladium, nickel, copper and other metals. Ivanhoe’s adjoining Platreef Mine is now in development and will have similar economics. We have had a lot of interest from the industry in finding the equivalent “Platreef in Montana,” and to date we have every indication that it is there at Stillwater. Maurice Jackson: Michael, let’s move from South Africa and go to your flagship project the Stillwater West, which is located in Montana, to discuss the latest press release regarding the Camp Zone Target Area. Michael Rowley: The Camp Zone target area is the fifth of 14 kilometer-scale target areas across the 25-km Stillwater West project. Eight of those 14 are “Platreef-type” targets. 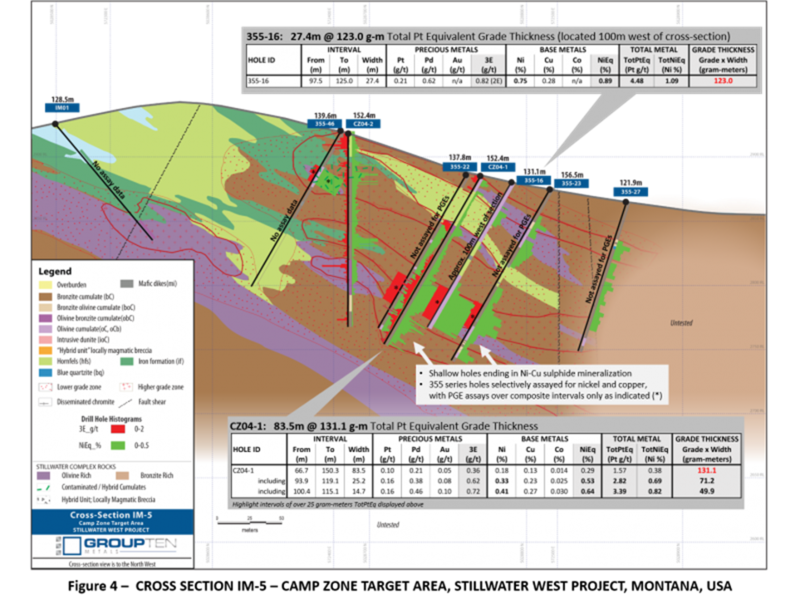 Like past news releases detailing the west side of the project, we have high-grade PGE “Reef-type” targets in the north of the claim block, higher up in the layered stratigraphy, and bulk tonnage “Platreef-style” targets in the lower portion and basal zones of the complex. 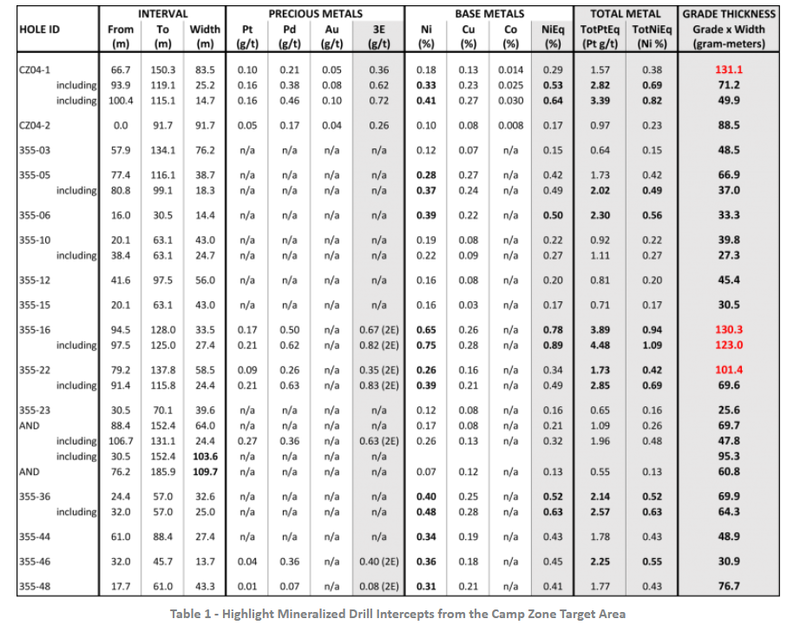 The Camp Zone target area has a lot of historical drilling by AMAX in the late 1960s and early 1970s, which successfully targeted nickel and copper sulphides in the basal zone, and resulted in the delineation of a continuous zone of nickel-copper sulphide mineralization in the Basal Series ranging from 15 to 110 meters in thickness over approximately 1.5 kilometers strike with average grades of 0.42% nickel and 0.23% copper. We also have platinum and palladium assays that were completed as composites over select intervals only. These demonstrate thick intervals of PGE enrichment, running up to 1.4 g/t palladium plus platinum. Maurice Jackson: Mr. Rowley, overall how would you grade the results thus far from the first five target areas? Michael Rowley: The first five “Platreef-style” target areas have demonstrated that the conductive highs we are seeing are in fact nickel and copper sulphides in both rock samples and drill core, and that they are generally enriched in PGEs, cobalt and chrome and other commodities. This is essential insight to have. The results at Camp Zone in particular position it as one of the three most advanced target areas at Stillwater West. We have an enormous land position and a large number of compelling targets across 25 kilometers of strike, so using that historical data to vector in on areas that can be advanced rapidly to resource delineation stage is essential. The known mineralized zone at Camp Zone, like the Hybrid Unit mineralized zone announced in February, provides us exactly thata starting point to build upon. Both are substantial mineralized zones, drilled with shallow holes without geophysics or optimization, and open for expansion in terms of both grade and size. AMAX’s work at Camp Zone also included valuable basic metallurgical results which show that standard 1970s-era flotation techniques can be used for effective nickel and copper sulphide recovery, along with a significant PGE component. Maurice Jackson: Can you comment on the price moves we have been seeing in palladium and platinum, we are in unprecedented territory. Michael Rowley: Palladium has indeed been on a tear due and is nearly doubling platinum in price. 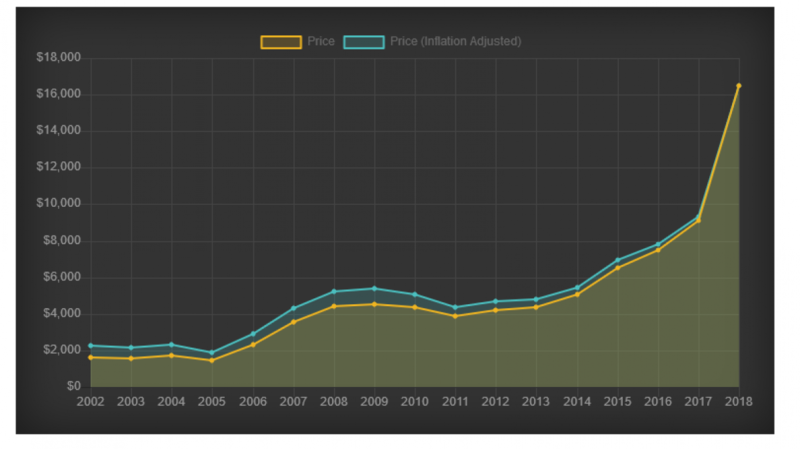 The price, of course, is driven by supply and demand, and the supply of physical palladium has been dwindling for years now while consumption of both palladium and platinum, driven mostly by the automobile sector for use in catalytic convertors, has been rising steadily. In addition, palladium was less affected by the switch away from diesel vehicles as palladium is generally used more in gas applications while platinum can be used in both diesel and gas engines. We’ve talked about gold and silver ratios in the past and how they historically stay within a certain range. The same is true of palladium and platinum, and at some point auto manufacturers will switch back to platinum and the prices will shift. Add to that the expected closure of platinum mines in South Africa and you have a very bullish case for platinum! At Stillwater we have both platinum and palladium, and also rhodium, plus also the technology metals nickel, copper and cobalt. Maurice Jackson: Sir, before we close what is the next unanswered question for Group Ten Metals, when should we expect results, and what determines success? Michael Rowley: Next up in our series of news releases is the Iron Mountain target area, which is the most advanced area on the project, so we are looking forward to making that release and discussing those results. In addition we are finalizing our targets and exploration plans for 2019 across the project, and will be releasing those in the coming weeks as well. The project is at an exciting point where the only unknowns are the good unknowns. We have brought together a remarkable land position, database and team, and our exploration programs in next two or three years will show what we actually have in terms of size and grade. It’s early days; we have a $10 million market cap, a great team, and our neighbour was bought for $2.2 billion. I think it will be a banner year. Michael Rowley: Funding and exploration plans are usually on people’s minds, so let’s touch on that. In terms of funding, we raised $1.2 million late last year and have about $2.7 million of in-the-money warrants that we can call any time to top that up. We also had some very good meetings at recent trade shows in Vancouver and Toronto. Those conversations are on-going with an eye to driving our best year yet at Stillwater West, and we look forward to making further announcements as the weeks progress. Maurice Jackson: For someone listening that wants to get more information on Group Ten Metals the website address is www.grouptenmetals.com. And as a reminder Group Ten Metals trades on the TSX-V: PGE and on the OTCQB: PGEZF. For direct inquiries please contact Chris Ackerman at 604-357-4790 ext. 1 and he may also be reached at [email protected]. As reminder Group Ten Metals is a sponsor and we are proud shareholders for the virtues conveyed in to today’s interview. 5) From time to time, Streetwise Reports LLC and its directors, officers, employees or members of their families, as well as persons interviewed for articles and interviews on the site, may have a long or short position in securities mentioned. Directors, officers, employees or members of their immediate families are prohibited from making purchases and/or sales of those securities in the open market or otherwise from the time of the interview or the decision to write an article until three business days after the publication of the interview or article. The foregoing prohibition does not apply to articles that in substance only restate previously published company releases. As of the date of this article, officers and/or employees of Streetwise Reports LLC (including members of their household) own shares of Group Ten Metals, a company mentioned in this article. But each property is unique. What works well in one place might not work at all in another. 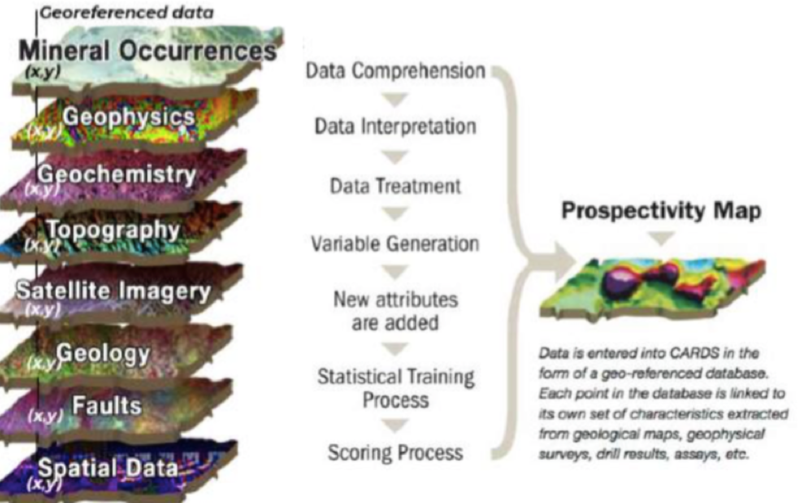 Exploration (not just for metals) is the perfect settinghigh uncertainty, lots of data, lots of variables, the potential for a big reward and substantial cost savingsfor AI to be a valuable, cost-effective tool to aid geologists. Albert Mining’s (AIIM:TSX.V) technology will never replace geologists, only assist them. Income tax software has been around for >20 years, but it has not replaced tax accountantsnot even close. What’s Albert Mining’s Secret Weapon? Albert Mining owns 100% of a proprietary software package called CARDS, a state-of-the-art computer system used to identify areas with a high statistical probability of containing mineral deposits. High statistical probability is a key phrase: CARDS does not provide certainty; no system of any kind can. The backbone of CARDS is a knowledge extraction data mining engine that uses pattern recognition algorithms to learn the signatures of positive and negative data points to create a model that makes predictions on the positive or negative nature of new data points. CARDS uses powerful algorithms to analyze digitally compiled exploration data and identify zones with a high potential for discovery. Data is entered into CARDS in the form of a geo-referenced database. Each data point, or “cell,” in the database is linked to its own set of criteria extracted from geophysical surveys, drill and rock sample assays, geological maps, etc. It’s critical that as much data as possible is captured and logged. Importantly, the system can take many different forms of data, (geophysics, geochemistry, topography, satellite, geology, faults, spatial data, etc.) which is why it’s such a robust predictive tool. The data is divided into two databases. The first database includes cells with known assay results (drill hole/rock samples data, etc.) and is used to developto learna model of the geological target being sought. The model could be set to identify targets containing >5 g/t gold. The second database, equally important, includes cells with no assay results. Complex algorithms are used to identify those cells that have a high similarity to the signatures of positive mineral deposits. In addition, in the analysis of each cell, the characteristics of cells within a specified distance, in the same neighborhood, are weighed into the evaluation of that cell. Therefore, even cells lacking data can be effectively evaluated if the combination of their limited characteristics, and their proximity to cells with other significant characteristics, is similar to that of cells with known positive results. 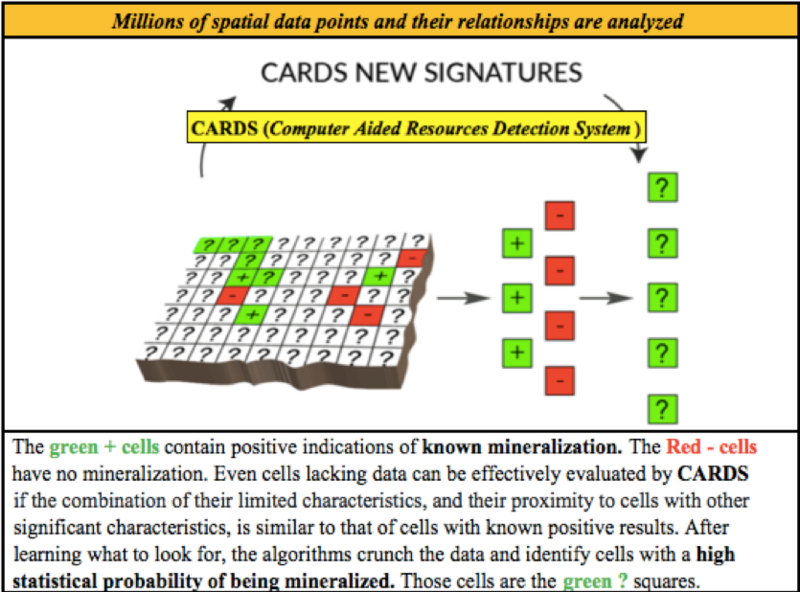 Unlike rule-based computer models, CARDS is not biased by the rules of any particular geologic model. In fact, because of CARDS’ ability to learn and make predictions based on the signatures of multiple positive data points, it can make predictions on any geological deposit type. 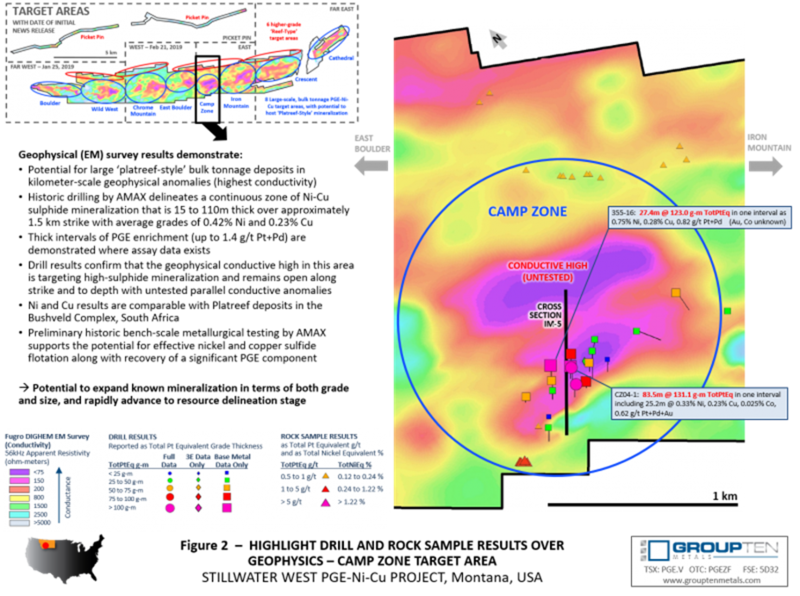 Once the data has been crunched, which typically takes several weeks, prospective targets generated by CARDS are evaluated with the client, and both parties discuss and outline potential exploration and drill targets. In the past, this is where Albert Mining’s work ended. They would provide a valuable service and move on. However, all of that is about to change. The company, with the support of large shareholders, is taking ownership stakes in companies it does work for. In addition, a new chairman should be named shortly. He or she will be well versed in this new operating model. The company’s objective is to develop new revenue streams by participating in the exploration success of its AI-assisted exploration. Albert Mining is currently running a program in Norway for Playfair Mining (PLY:TSX.V). Management recently invested CA$100,000 in Playfair at CA$0.05 (2 million shares) and signed a CA$75,000 service agreement. The RKV project covers two past-producing volcanogenic massive sulfide (VMS) copper mines (Kvikne and Rostvangen), a magmatic nickel-copper deposit (Vakkerlien) and >20 additional mineral occurrences. Management will use its proprietary technology to analyze a large amount of geophysical, geochemical and geological data to uncover patterns hidden in Playfair’s data. It will then run those machine-learned patterns through its algorithms to identify prospective targets. This technology has been successful in assisting geologists in the identification of a number of major mineral discoveries, especially in the context of VMS mining districts. As management continually tweak CARDS, they will now benefit more directly, and more substantially, from their high success rate. CEO Michel Fontaine tells me his company will look a lot different in three or four months. A new chairman, a new business model, perhaps programs outside of just mining. Readers may recall that in a recent interview with Michel he mentioned searching for abandoned underground land mines and exploring for water as possible new business segments. Any high-value field or application where there’s a lot of complex data is ideally suited for CARDS. The content of this article is for information only. Readers fully understand and agree that nothing contained herein, written by Peter Epstein of Epstein Research [ER], (together, [ER]) about Albert Mining, including but not limited to, commentary, opinions, views, assumptions, reported facts, calculations, etc. is not to be considered implicit or explicit investment advice. Nothing contained herein is a recommendation or solicitation to buy or sell any security. [ER] is not responsible under any circumstances for investment actions taken by the reader. [ER] has never been, and is not currently, a registered or licensed financial advisor or broker/dealer, investment advisor, stockbroker, trader, money manager, compliance or legal officer, and does not perform market making activities. [ER] is not directly employed by any company, group, organization, party or person. The shares of Albert Mining are highly speculative, not suitable for all investors. Readers understand and agree that investments in small cap stocks can result in a 100% loss of invested funds. It is assumed and agreed upon by readers that they will consult with their own licensed or registered financial advisors before making any investment decisions. At the time this article was posted, Peter Epstein owned no shares of Albert Mining and the Company was an advertiser on [ER]. Readers understand and agree that they must conduct their own due diligence above and beyond reading this article. While the author believes he‘s diligent in screening out companies that, for any reasons whatsoever, are unattractive investment opportunities, he cannot guarantee that his efforts will (or have been) successful. [ER] is not responsible for any perceived, or actual, errors including, but not limited to, commentary, opinions, views, assumptions, reported facts & financial calculations, or for the completeness of this article or future content. [ER] is not expected or required to subsequently follow or cover events & news, or write about any particular company or topic. [ER] is not an expert in any company, industry sector or investment topic. One of the most important things about making calls about any future price movement is to have confidence in your research team and systems. The second most important thing is to make these calls public so everyone can see if you were right or wrong about your predictions. Predicting the future, often many months in advance, is not an easy task. We like to ask people, how many people do you know that can predict something in the future, almost to the exact day, and find they were accurate more often than being wrong? In February/March 2019, our research team honed in on the April 21~24 dates as a key cycle date for a very likely momentum bottom setup. You can read our research here. We believe these dates will be key to the future rally in Gold and they may very well be the last time we see sub-$1300 price levels for a while, but gold does need to reverse to the upside this week. Currently, Gold is trading at $1278.10 with a recent low at $1273. Remember our original prediction that the momentum base would likely setup between $1260 and $1275? Right now, we believe this Momentum base is setting up exactly as we predicted back in October 2018 – over 6 months ago. As we continue to watch this Momentum Base setup play out, we urge skilled traders to watch the outlying symbols for signs of confirmation and validation. The news about the Iran Oil Sanctions, today, may become a key element going forward – but it is too early to tell right now. 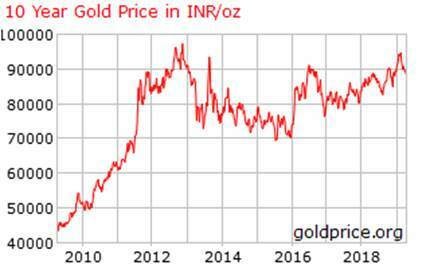 We believe some global economic event will drive prices of Gold much higher over the next 30+ days. Gold has moved lower over the past 30+ days from the $1340 level down to near the $1270 level – just as we predicted as well. The timing of this recent downswing in price is perfect for our April 21~24 Momentum Base call. We do believe there is still a chance that a $1255 to $1260 level may be seen this week or next. The Momentum Bottom/Basing formation may form over a 7 to 10+ day range. So, pay attention to these opportunities in Gold over the next few days and weeks. NUGT (3x gold miners bull ETF) continues to fall as Gold Bases. 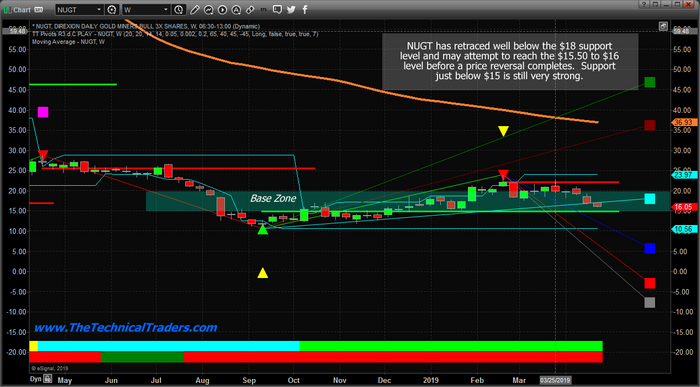 In fact, NUGT has fallen to levels that we have not seen since January 2019. The reality of the matter is that NUGT may be the best confirmation tool/symbol we have right now for timing the end of our Momentum Base in Gold. When NUGT rotates higher and forms the base, it will very likely mark the end of weaker prices for the entire precious metals sector and the beginning of the upside price rally we have been predicting. As our research team likes to state – this is “do or die” time with regards to our predictions from many months ago. We’ve stuck by them for months, telling anyone who would listen this setup would be the last time you see sub-$1300 levels in Gold for many months – possibly years. 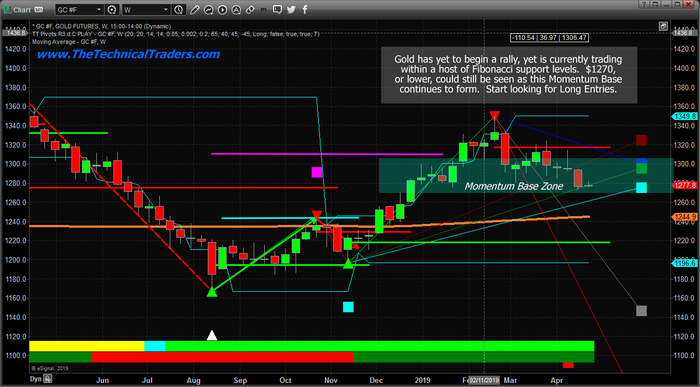 If our analysis is correct, we suggest you pay attention to these symbols and lower Gold price levels right now. Once this move begins to rally, it could take the markets by surprise. Our expectations are that by mid-May, or so, we should already be in an upside price swing that should be targeting the $1450 to $1550 level. This means we have about 7 to 15 trading days until we start to see some real upside price move in precious metals. We should remind you that gold needs to find a bottom this week and price could become choppy and volatile. Get ready and follow our research. How many other research firms do you know that are capable of calling the markets 6+ months in advance with this type of accuracy? Please visit TheTechnicalTraders.com to learn how we can help you find and execute better trades for your future. Now, as a fervent addict to the thrill of new mineral discoveries (“There ain’t no fever like gold fever!”), I have recently begun to feel like the heroin addict searching through life for that rush of euphoria that arrived long ago with that first hypodermic injection but the reality is that the new generation of investors found their hypodermic adrenalin in the form of technology stocks, then crypto, and finally and more recently, weed. My friend James West was a gold and mining newsletter writer back in 2010 with the first promotional piece for Tinka Resources Ltd. but has since evolved into the foremost authority on cannabis and is enjoying a thriving if not booming career renaissance (and it couldn’t happen to a nicer man). The remaining advocates for investment in precious metals and the related mining and exploration shares are in effect living a life “gratified by pain, degradation, deprivation, etc., inflicted on oneself either by one’s own actions or the actions of others.” In other words, they are practicing a form of masochism. Take the last two companies that I have referenced in this missive, Getchell Gold Corp. (GTCH:CSE) and Western Uranium & Vanadium Corp. (WUC:CSE; WSTRF:OTCQX). GTCH is currently raising money and while it is going surprisingly well, it has not been an easy raise, what with the dismal action in metal prices since mid-February. WUC, however, began its US$2 million raise three weeks ago and Tuesday announced that it was significantly oversubscribed and in fact came in just under the full exercising of the 50% over-allotment option. This was a terrific development for the company but what surprised me greatly was the investor reaction to uranium and vanadium that was so diametrically different than the reaction to exploration for gold and silver in the most prolific precious metals environment in North America. 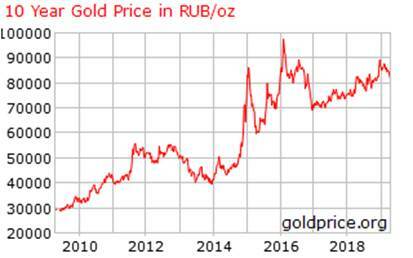 The average investor “gets it” when you talk about the uranium (and vanadium) outlook but they stare at you with glazed-over eyes when you try to describe how Barrick Gold went from $1.80 to $3,300 per share from its activities in Nevada in the 19822010 period. Here is yet another example of life in the isolated world of sound money advocacy. I was recently introduced to a private start-up company (that shall remain nameless, at least for now) and suffice it to say, the best description is that it is a type of “Facebook for Cannabis users.” I had the pleasure of meeting over lunch with the 30-year-old Millennial female, exceedingly well trained and very well spoken, with a Master Grower’s License and an MBA from the Ivey School, a couple of weeks ago after which I was asked to offer consulting advice in the area of capital markets related to financing. She asked me if I could assist the company in finding a few investors to participate in its seed round and while I won’t mention the amount, I proceeded to call an accountant friend that uses me for feedback on mining investments. This very successful fellow has over the past ten years had his fingers in major real estate deals and crypto deals but also in the early-stage cannabis deals such as Canopy, so with that knowledge, I decided to ask him to assess this new non-mining venture as more of an “acid test” than anything else. I described the deal as best I could, which was totally lame given my total ignorance of anything related to social media or weed. His reply after perhaps three minutes on the phone was “How much as you trying to raise again?” and after I told him (it was north of six figures), he said “I’ll take it all,” at which I choked on the phone and I said would get back to him shortly. I then proceeded to call a very successful realtor I know and I got precisely the same result. “I’ll take it all. Send me the forms.” I then proceeded to make seven additional calls and got seven additional “I’ll take it all.” responses. The point here is that I could work for a month to set up the best mining deal in the world and it would take another month or two to finance it but if it is anything related to the Millennial checklist of “suitable investments” (which include social media, cannabis, artificial intelligence and blockchain) four phone calls and it is done. Now, the contrarians would tell me that it is a sign of a “classic top” but the reality is that for the past decade, investors have been rewarded by buying more of “what is working” and selling “what isn’t.” Pot deals have been working but more importantly, mining deals, by and large, have not. So, when I use the term “masochism” to describe the behavioral quirks of the average gold investor, the term “glutton for punishment” comes leaping into the forefront. To be constantly searching for that drill hole in the sky or the ultimate ascendancy of gold to $10,000 per ounce as all politicians, regulators and bankers disappear into a vaporous hole of failure and disgrace is not only unwise, it verges on Einstein’s description of madness: repeating the same behavior over and over for the same negative outcome. 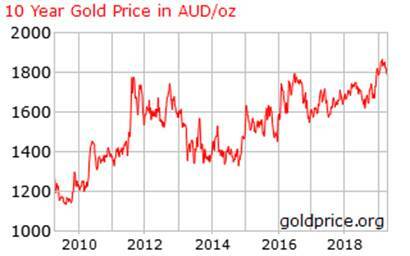 While the average American sees little benefit to owning gold, domestic prices in Australia, Turkey, Russia and India have recently approached or surpassed their one-year highs. Only the U.S. and China (pegged the USD) have stayed at or near the levels of 2011. 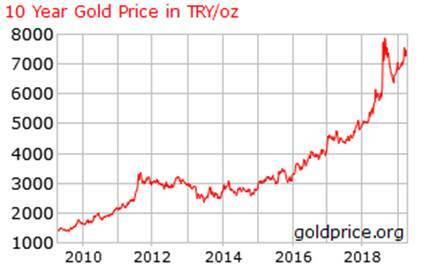 From the numerous charts posted below, it clearly demonstrates gold’s utility as a protector of purchasing power, particularly in countries such as Turkey that have experienced sever currency crises. The point here is that gold actually has fulfilled its role as a safe haven in all countries across the globe except two: the U.S. and China. The U.S. vigorously defends its currency versus gold and China has a USD peg on the yuan and yet, the two countries are diametrically opposite in their actions. 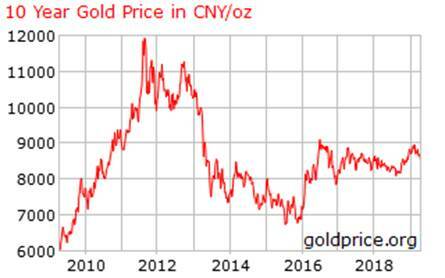 China has been a voracious buyer of gold and seller of U.S. treasuries while the U.S. has done the opposite. The name of my publication was changed last year from “Gold and Gold Miners” to GGM Advisory for one very simple reason: relevancy. If actuarial tables conclude that the Baby Boom population is a rapidly shrinking demographic, if studies of investment demand confirm that the new generations of investors are decidedly ambivalent (if not hostile) to gold and silver investment, and if regulators and exchange officials continue to condone and indeed endorse continued price suppression, then waiting for the USS Nimitz to become a disabled, unpowered relic leading to a moon rocket in metals and miners could become a very, very long exercise. Most of us that are in or are approaching retirement don’t have the luxury of time on our sides to await the arrival of that one singular event that justifies twenty or thirty years of holding on to the precious metals while the S&P 500, the NASDAQ, cryptocurrencies and weed make millionaires out of 30-something messiahs too young to remember the bursting of the dotcom bubble and in some cases, the 2008 subprime meltdown. 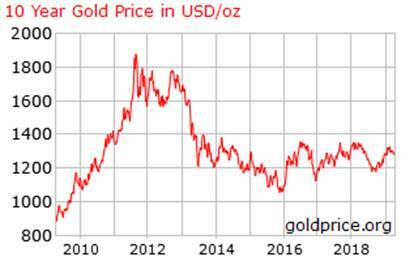 Since 2009, we have had numerous events that should have been the moment where gold and silver emerged as the “Go-To” asset class with the most recent being last Christmas Eve when the S&P closed in bear market territory while gold was screaming higher. With the flick of a switch, Treasury Secretary Smilin’ Stevie Mnuchin stepped up and called upon the Working Group on Capital Markets to put a stop to the crash in stocks and since February 20th, every gold rally has been stomped out with intervention after intervention while every dip in the NASDAQ has been magically supported. It is the same narrative whether 2001 or 2008 or 2018: rigging stock markets are essentially this decade’s version of Roosevelt’s “New Deal” back in the 1930s. Instead of building roads and dams, the policy-makers today build nothing except moral hazard and a generation of the “Entitled.” It is a dangerous precedent and one which cannot last but the problem for us is that is HAS lasted a great deal longer than we might ever have imagined and there is nothing near-term to suggest that the Great American Ponzi Scheme cannot continue. All right, now that I have concluded my rant on the madness being inflicted upon us, I have a couple of observations to make about gold. Earlier last week, I was looking at GLD wondering whether my GLD May $124 puts might hit $5.00 before the end of the week and then it occurred to me that my “Line in the Sand” at the prior lows of $1,282 and the subsequent “breakDOWN” was no different in its blatancy than the “breakOUT” in Barrick. So, I pulled up the GLD chart and lo and behold, while the sub-30 level for RSI sported two super buying opportunities in 2018, it has not been much under 35 in all of 2019 thus far. Now, notwithstanding that the stock markets are getting somewhat stretched, I have to respect two things: 1) the dotted red line in the RSI window in the chart below and 2) that only in the perverse world of precious metals are technical “breakdowns” to be BOUGHT while technical “breakouts to be SOLD. 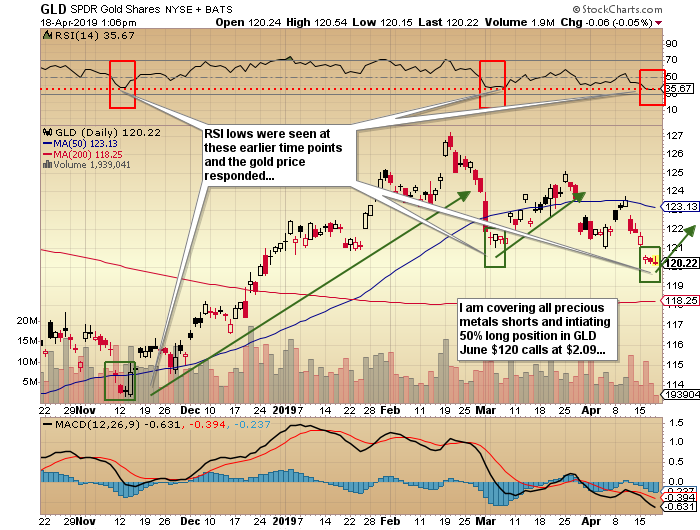 Therefore, I have covered all of my shorts in both gold and the mining shares and initiated 50% long positions in JNUG, NUGT and the GLD June $120 calls. The chart below pretty much says all that is needed: we are at an inflection point that represented tradeable bottoms in mid-November and early March. As a final observation (which could also be seen as a “confession” of sorts), I use my own behavior as a market barometer and with the benefit of time and age, I always go back and re-read my missives because they give me a sense of perspective on markets in the same way Anne Frank’s diary provided perspective of a different time and place. Both diaries are extremely personal but both give the reader a wonderful window into the mindset of an era. My entries from the week of October 19, 1987, revealed a relatively young financial advisor (34) coping with the total destruction of client assets, and to go back and re-visit the emotions contained in the words and syntax is still to this day painful. Anyone reading the diary of a young girl trying to avoid extermination is emotionally impacted far greater than by the musings of a stressed stockbroker but both messages allow reflection. I carry the utmost of conviction that sound money principles will prevail and I promise that I won’t go into a seventeen-paragraph repetitive blather as to “WHY?” but if people are going to listen to what I have to say, I have to provide “actionable ideas” that carry logic, excitement, and weight. My dad died in 2013 at the ripe old age of 89 and one of the things he drilled into me was that one of the things he learned as a WWII navigator in the RCAF was that many times, people tend to “think too much” as opposed to simply “reacting. As an example, as a fifteen year-old hockey-playing “sniper” (goal-scorer), I was going through a particularly painful slump where everything I fired at the net was getting blocked, saved, or veering wide. On the drive home from the venerable St. Michael’s Arena, after hitting four goal posts and extending the dry spell to six games, I finally asked my dad (who never played the game except shinny on Grenadier Pond) what I was doing wrong, to which he responded “You’re thinking too muchjust fire the biscuit.” The next game, on my first possession, I didn’t even look at the net or the goalI just ripped it from outside the blue line and, as if it had eyes, it pinged in off the far right post and into the goal. As traders and investors, we all tend to “think too much” so when I launch one of my invectives upon all of you, try to remember that in the big picture, 5,000 years of fiscal history would validate the logic of owning gold but within that window, numerous generations have perished in poverty while bequeathing tonnes of it to their heirs, who sold it, bought (and smoked) cannabis, traded Bitcoin, and lived happily ever after. 2) The following companies mentioned in this article are billboard sponsors of Streetwise Reports: None. Click here for important disclosures about sponsor fees. As of the date of this article, an affiliate of Streetwise Reports has a consulting relationship with Western Uranium & Vanadium. Please click here for more information. Within the last six months, an affiliate of Streetwise Reports has disseminated information about the private placement of the following companies mentioned in this article: Western Uranium & Vanadium. I wrote a book in January I called Basic Investing in Resource Stocks. So far it has the highest reviews I have ever seen on a book and I pretty much read a book a day. You can buy the Kindle version for $5.99. I priced it low so everyone can afford to buy it. Someday I’m going to write the sequel to it. I’ll probably call it Advanced Investing in Resource Stocks. It’s going to be priced at $1000 for the Kindle version and a lot more for the print edition. It will be about five pages long. I’ll do two pages listing the crooks, con men and idiots in the business that mine investors and another two pages for the people you want to invest with. And a title page, of course. You have to have a title page. If you went to the racetrack and wanted to make some money but didn’t know anything about horses or the odds, there is actually an easy way to make money. If you are standing in a line with the rest of the punters and suddenly a tiny man wearing racing silks (or woman or transgender or whatever) pushes into the line in front of you and empties his wallets, signs over his last paycheck and hocks his gold Rolex and put it all on a bet for him to win his race, maybe you should bet with him. After all, he or she know a lot more about horseracing than you do. You don’t actually need to know anything to make a winning bet. You just need to know who does know something about the race and follow their lead. That’s why my next book is going to be both short and really expensive. Aurania Resources Ltd. (ARU:TSX.V) just came out with an interesting press release announcing among other things, Keith Barron is loaning the company $4 million CAD for two years at 2% interest and the loan is unsecured by anything. At first glance you might conclude Dr. Barron has lost his ever-loving mind. 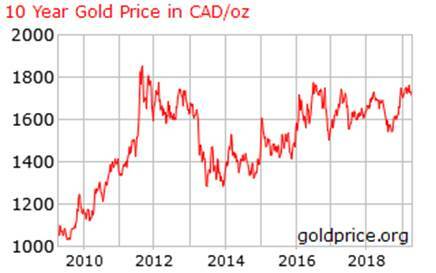 There isn’t anyone in the mining business that would loan $4 million CAD to a junior at 2% and not demand either higher interest (like 55%) or a whack of shares. As much as I love Barbara, I wouldn’t loan her money at 2%. Even love has limits. But think for a moment. Keith is drilling the Lost Cities Project. He’s finished six holes so far but hasn’t gotten the assays back or announced any holes. Clearly he wants to do a lot more drilling than he has money allocated for. Aurania is worth $105 million right now. Keith wouldn’t have any problem doing a financing. But if it did, he would have to expand the number of shares. Maybe since he is the biggest shareholder already he realizes that they are on to something really really big. Since he’s going to end up spending tens of millions of dollars defining a resource, he may was well wait for good results to come out and do a financing at a much higher price. If Keith Barron pushes his way into the betting queue in front of you wearing racing silks and puts his whole paycheck on his horse to win, maybe he knows something you need to know. He won’t be a tiny man, however, he’s sort of a chunky monkey. Insiders will always know far more than you will. You don’t need to know anything more than how they are betting. Aurania is an advertiser. I have bought shares in the open market and participated in two private placements. Do your own due diligence. 1) Bob Moriarty: I, or members of my immediate household or family, own shares of the following companies mentioned in this article: Aurania Resources. My company has a financial relationship with the following companies mentioned in this article: Aurania Resources is an advertiser on 321 Gold. I determined which companies would be included in this article based on my research and understanding of the sector.